Of the 37 types of £2 coins in circulation in 2017 only 3 have the 2017 date on them. Your best hope is the Brittania which is relatively scarce. For some unknown reason the Royal Mint have not issued the 2017 WW1 Aviation or the Jane Austen into circulation yet. I have no idea why. However, they are available in Brilliant Uncirculated condition from the Royal Mint and other good coin dealing sites. Keep looking and good luck. You could always try eBay. Thanks, i'll keep my eyes out. We've collected all the other ones from shops etc... We have a collection of 50ps and £1s. Got the Kew gardens one too! Had them a few times before realising how rare they were!!!! The Kew gardens is the only 50p I don't have. It is selling for at least £70 on eBay. Beware of copies though. For info' a new £2 coin (Vulcan bomber, part of a 5 coin RAF centenary set) was issued today. pembsexile wrote: The Kew gardens is the only 50p I don't have. It is selling for at least £70 on eBay. Beware of copies though. I've been in the Vulcan! Which undoubtedly came as a shock to Mr Spock. Interesting thread, by the way. Hope it endures. JonD wrote: ha ha. Bad man. mad norm wrote: Just been fossicking through a tin .. Norm, on a serious note, in relation to your silver threepences, check them carefully. If any of them are dated pre 1920, they are worth quite a bit. Prior to that date all silver coins were sterling silver and therefore nearly 100% silver. The Royal Mint changed the metallic content of silver coins after that date so that for their metallic content only, they will be worth something. If you want to pm me for specific value information of the silver coins you have, I can check against the Coin annual yearbook. I have a special edition Iraqi Army Anniversary gold coin, would that be in your book Pembs? Willthiswork wrote: I have a special edition Iraqi Army Anniversary gold coin, would that be in your book Pembs? Cool. Will put some pics up later. 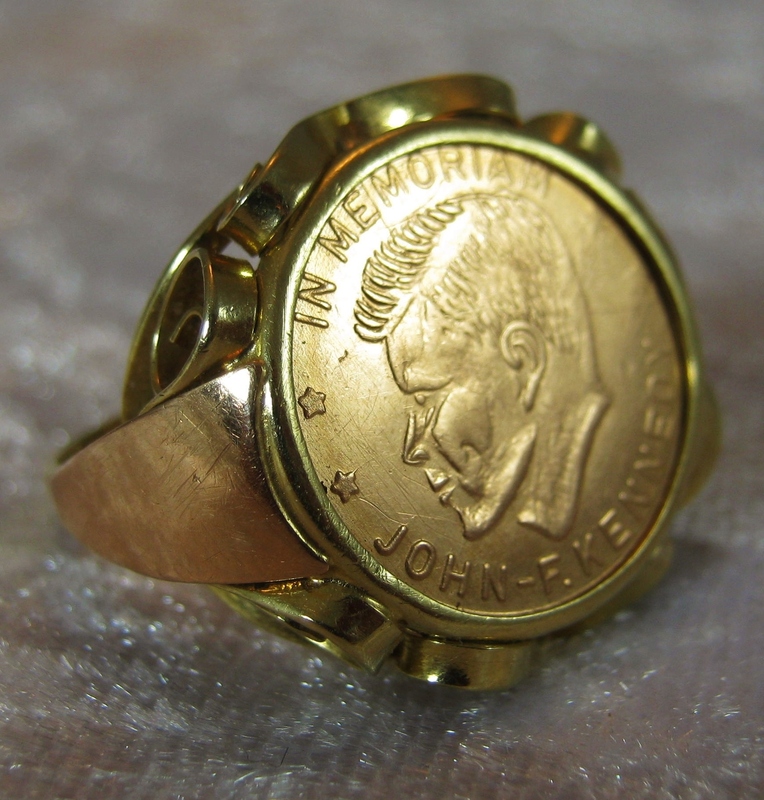 Also have a JFK memorial gold coin inset in a ring. Does this look anything like your Ring?